The day before Thanksgiving is one of the worst days for travel every year. Thanksgiving is the peak day for home fires in the US. About half of all turkey-related ER visits are due to knife-related injuries. There are few better ways to enjoy time with friends and family than around a massive Thanksgiving feast. Unfortunately, however, injuries on Thanksgiving are more common than you may think. From backyard football injuries to burns from deep-frying a turkey, trips to the ER are all too common on this holiday. As Miami personal injury lawyers, we’ve seen these injuries firsthand more times than we can count. Whether you grew up playing football or simply enjoy watching it on TV, playing a game of football in the backyard can be fun — and dangerous. Some people may be injured from an overzealous tackle, while others may twist an ankle after not being active in… well, a long time! If you know that backyard football is routine for your family’s Thanksgiving, start preparing now. Get some exercise so your body isn’t shocked by the sudden onset of activity. Be sure to stretch regularly, and learn the limits of your body so you aren’t pushing yourself too far on the big day. Be sure to stick to flag football or two-hand touch; some of the worst injuries come from tackles. Wear the proper clothing for the activity. Go through some stretches with the family before and after the game to make sure everyone is limber. If you do get injured, don’t keep playing — you’ll only make the injury worse. Never consume alcohol before playing. When it comes to Thanksgiving dinner, you probably want to impress everyone at the table with a beautiful spread of delicious food. While doing so is certainly possible, you should remember that advanced knife-work and cooking techniques come with time and experience. Stick to what you know. While you’re cooking, be sure to stay near the oven. Thanksgiving is the top day for home fires in the United States — don’t become part of that statistic. If you can, cook the minimum amount of food possible at a time to ensure you aren’t forgetting about something in the oven or on the stove. If children or other adults are going to be helping in the kitchen, make sure they know their duties are are up for the job. For instance, a young child can probably help fill a pie or punch out cookie shapes, but they probably should be using the oven. Know the limits of everyone on your Kitchen Team. If you’re like most Americans, the turkey is going to be the crown jewel of your Thanksgiving spread. Be sure to buy a turkey at least a couple days in advance so it has time to thaw properly. Once it’s thawed, cook it immediately. If you have one, use a good probe thermometer to monitor the internal temperature of the bird; it should be at least 165° F before you take it out of the oven. If you don’t have a probe thermometer, shoot for about 15 minutes per pound of meat. Be sure to check the turkey’s temperature at the thickest part of the breast or thigh to ensure it’s cooked thoroughly. Make sure your frying pot is big enough for your bird. Always use a defrosted turkey. Keep the pot in a level, open clearing, away from anything that could catch fire. Never overfill the pot; always follow the manufacturer’s guidelines. NEVER leave the pot unattended. Wear goggles and protective clothing to prevent burns from hot oil. Keep pets and children away from the fryer. Give the person a few sharp blows to the back with your hand. Perform the Heimlich Maneuver, if needed. Call 911 if someone is choking and can’t breathe or speak. Alcohol is another Thanksgiving tradition that can quickly get out of hand. Always monitor your guests’ alcohol intake. If you think they’ve had too much, cut them off and switch to water or coffee. While water or coffee won’t help them sober up faster, cutting off the flow of alcohol will stop them from getting more drunk. If you know your guests are too drunk to drive home safely, offer them a place to stay the night. Or, if they live closeby, you can call a taxi — or be your own taxi service. Do whatever you need to do to avoid letting drunk guests get behind the wheel of a car. It’s almost tradition to pack up some of your side dishes together in one container, since they’ll be going on a leftover turkey sandwich anyway. Avoid the urge to do this. You never know if one food got contaminated, and storing multiple dishes together is a sure way to spread food poisoning. You should have everything packed away in the fridge within two hours of serving. Store the food in the most shallow containers possible. If they aren’t eaten within three days, either throw them away or move them to the freezer. When you reheat your food for that classic turkey/stuffing/cranberry sauce/gravy sandwich, be sure it reaches at least 165° F. Any gravy you use should be boiled. That way, any bacteria that may have developed is killed off before it has a chance to get into your system. While the day before Thanksgiving is one of the most dangerous days of the year to travel, the myth that it’s the most dangerous simply isn’t true. That doesn’t mean you shouldn’t take precautions, however. If you can, arrive at your Thanksgiving destination a few days early to avoid the dangers and headache of increased traffic. If you’re flying, know that airlines often charge more for travel around Thanksgiving; head out no later than Monday or Tuesday, if possible. If you’re involved in a car wreck around Thanksgiving, know that you have legal options. You may be entitled to compensation, especially if the wreck wasn’t your fault. 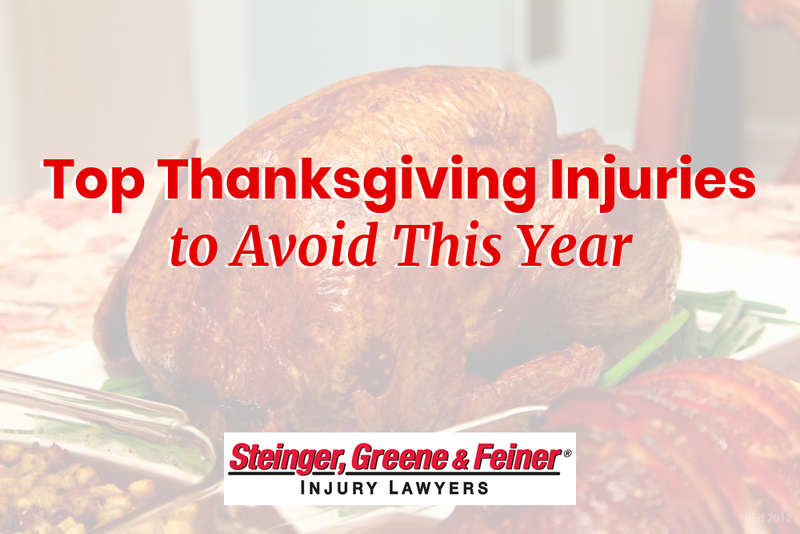 If you suffer an injury on Thanksgiving due to someone else’s actions or negligence, you have legal options. At Steinger, Iscoe & Greene, our Miami personal injury lawyers have recovered over $1 billion on behalf of our clients. Give us a call anytime, even on Thanksgiving, to discuss your case. We’re open 24/7, because justice never sleeps.